The new connection of wires to the PCB offers optimized PCB design, combined with outstanding contact qualities. 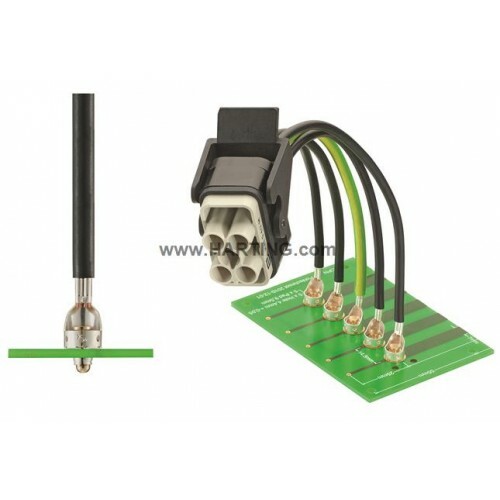 The Han-Fast® Lock is flexible and allows a fast and simple PCB connection. The PCB has one drilled hole and a pad. The inner surface of the plated drilled hole serves as the interface. The Han-Fast® Lock is simply inserted into the plated through contact hole. The locking pin is pushed in and hence locks the contact into position. The solder free connection technique is easy to handle and to operate. Maintenance has been made simple with the facility to detach the contact. Han-Fast® Lock also supports SMD assembly of the PCB.